On this ski expedition you will have the opportunity to climb the volcanic Mountains of central Anatolia and cross the Taurus from South to East. We will also climb Mt. EnginTepe (also called Mt Embler) 3723 m high of Aladag region. Two big and majestic volcanoes of central Anatolia entire satisfaction, giving you the sensation to dominate the snow covered area, before entering in the spectacular and surrealistic landscape of Cappadocia. During our ski expedition we will have opportunity to contact with the local people and opportunity to learn their life style. Our meeting point for this ski expedition in Ankara airport. Transfer to hotel for overnight.. Depart by bus (4 hours driving) to a village at the food of Mt Hasan extinct volcanic Mountain of Anatolian, which also erupted 3 million years ago and formed Cappadocia area.. Afternoon will be an opportunity to have a first contact with the snow and to visit the village. Dinner and overnight in a guesthouse. (2100m). We ascend Mt. Hasan summit from the south route about 5 to 6 hours. 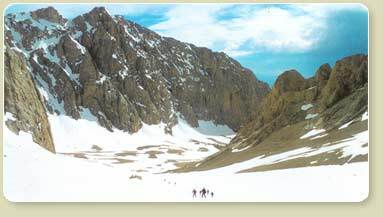 Climbing gradually up the snow is more and more abundant and the view on the Anatolian plateau magnificent. Mt. Erciyes, Cappadocia are visible from the summit. 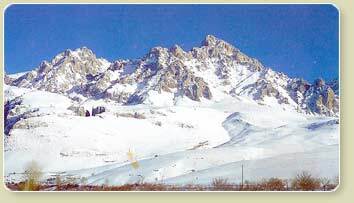 Descend and drive to Demirkazık village at the foot of Mt Taurus. Overnight in the village. (1650m). In the morning transfer in the Emli valley. Wearing our ski we cross the fragrant pine forest and walk up to a pass at 3400 m. Here you may take the opportunity to climb Mont. Engin Tepe (Second peak of the Aladaglar range: 3723 m). Then a superb descent in the Karayalak valley, an impressive canyon, with some fairy chimneys. Dinner and overnight in the same village. Morning transfer in the Narpuz valley. This is an exceptional day. We wear our skis and we follow to a pass at 3200 m before getting in the impressive Cimbar canyon with straight rock wall, a wild area. Our ski touring of the day end in the village. Dinner and overnight in the village. We join back the Emli valley. Through pine forest we ascend up to the Alacan plateau (2450 m) from the Kucuk Mangırcı valley. From the Alacan Plateau, you may take the opportunity to ascend one of the several low summit (about 3000 m) surrounding the plateau. 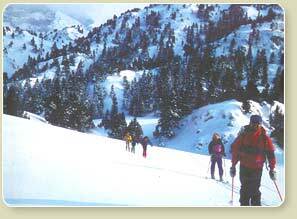 We come to the departing point by ski trail of Buyuk Mangırcı valley. End of afternoon, transfer to foot of Mt Erciyes in Kayseri. Dinner and overnight in mountain house at 2200 m.
This volcano is one of the most fascinating ones in the world. 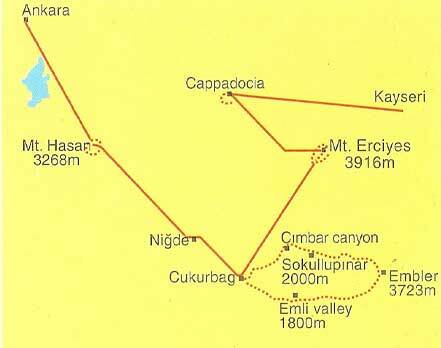 We will ascend the Mt Erciyes (Argeos), a long traverse to reach its top from which the panoramic view is worth to see. 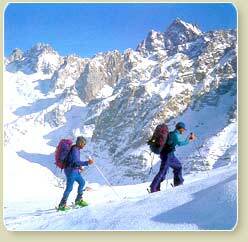 A fascinating skiing descent through the several valleys of the majestic volcano will bring us to our minibus. 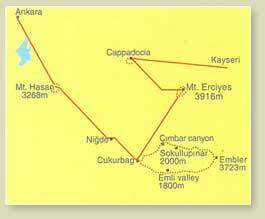 Drive to Cappadocia for overnight in pension. Morning sightseeing in unique Cappadocia we will visit to the rock churches, monasteries, cave dwellings, Fairy chimneys, remote canyons, bizarre rock formations and the other unusual and beautiful areas of Göreme, Zelve and Ortahisar. Drive to Ankara, overnight at hotel.